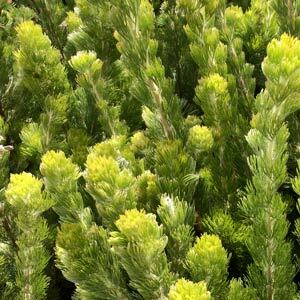 Most Adenanthos are known as ‘Woollybush’, and their fine soft foliage is the reason. They are a group of small trees to shrubs depending on the species and cultivar. Very attractive and used widely as specimen trees as well as for foliage plants in the garden border. Adenanthos are part of the proteaceae family, mainly from Southern Western Australia. The species contain shrubs that range from low growing prostate specimens to taller varieties that will grow to 3m. Reasonably drought tolerant and can be pruned. A. cuneatus is a new species well worth considering. It is because of the wonderful foliage and their ability to be grown in containers that they are becoming fashionable as an Australian Native Christmas tree. And the do look great with a few decorations. Adenanthos ‘Cunninghammii Prostrate’ is a lovely low growing form reaching less than 1m. An excellent ground cover plant with nice deep red flowers. Full sun to part shade. A. cunninghamii (Woollybush) – A bushy spreading plant with a very useful prostrate form available. A. cygnorum (Common Woollybush) – Attractive foliage with new growth showing red tips, not as neat a habit as A. sericeus. A. sericeus (Albany Woolly Bush) – Probably the best foliage and a nice upright growth habit. A few selected forms are becoming available.